I packed up my camp and headed out of Pinnacles without a plan for where to go. I headed toward Hollister for food and fuel. Along the way, I thought of some of my options. 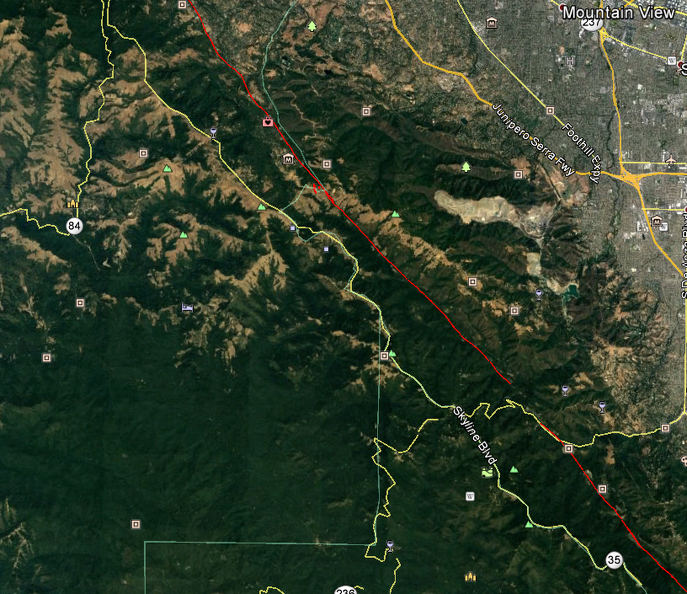 I thought about heading east to the Yosemite Valley, or maybe I would do the Mount Hamilton Loop and Mount Diablo. I stopped at adventure headquarters (Starbucks) to check out my options. The weather for the evening and on Friday was not looking too good anywhere. It was supposed to be in the mid-30s and raining in Yosemite. The Bay Area was looking at wind and rain overnight. I decided to head north and figure things out as I went. 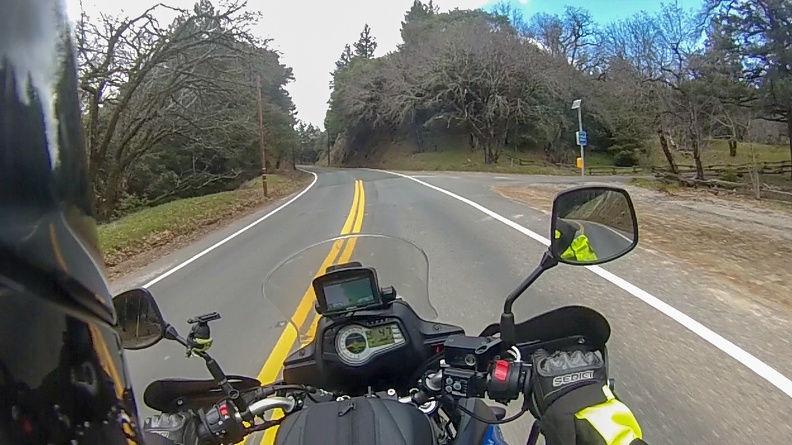 I made my way over to Highway 101 and went south a couple miles to take Monterey County Road G11 (aka San Juan Rd.) west to Watsonville. G11 wound its way through miles of flat farmland. The smells of growing vegetables filled the air; however, when I passed the town of Aromas I smelled the unmistakable odor of cinnamon gummy bears – perhaps Aromas was aptly named. 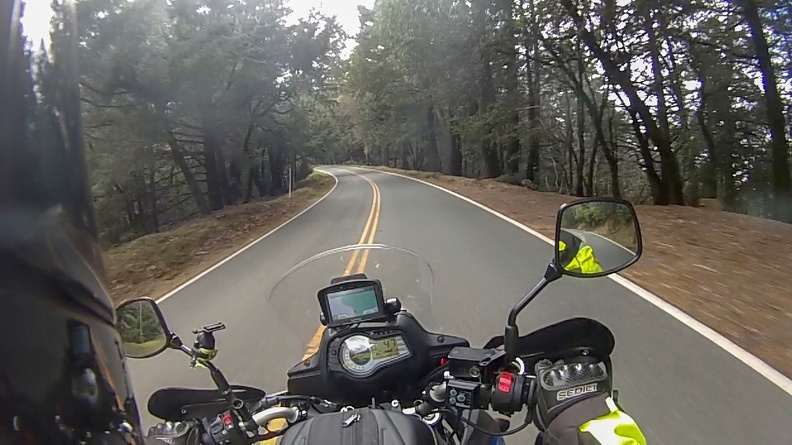 Summit Road crosses Highway 17 and turns into Highway 35, also known as Skyline Boulevard. Heading north from the intersection with Highway 17, Highway 35 is barely one-lane wide and has many tight blind curves. The road was quite a challenge. Once it passed Black Road the highway opened up and I could increase my speeds. I could see why Skyline Blvd. is popular with motorcyclists. I didn’t see many on the road today, though. I saw more sports cars than anything. Perhaps it’s still a little too early in the season. As the road climbed higher along the ridge and toward Mount McPherson it started to get colder. I had to stop and put my jacket liner in. Off to the west, I could see the Pacific Ocean and an incoming storm. Off to the east, I could see San Francisco Bay. I stopped at the legendary Alice’s Restaurant at the intersection of Highway 35 and Highway 84. 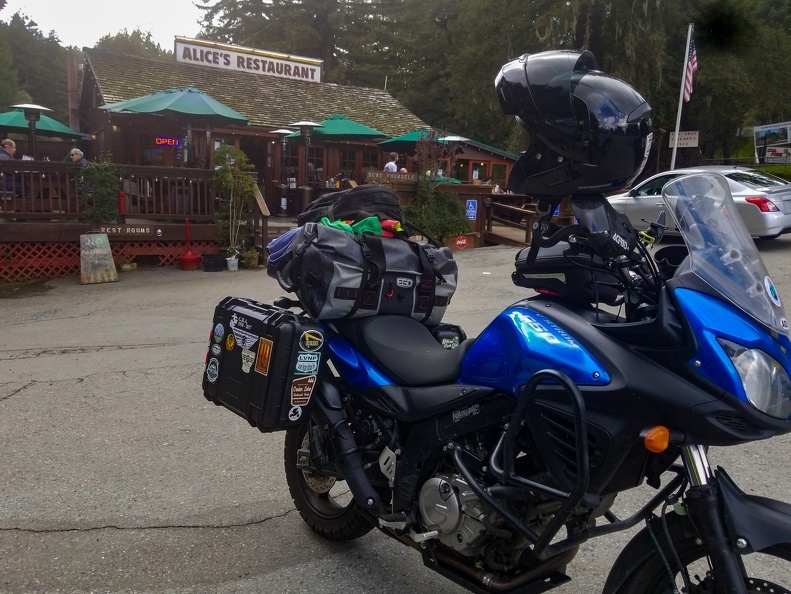 Alice’s is the destination for people riding and driving the area around Skyline Blvd. I had to stop for a snack. When I stopped, I was given some compliments on my motorcycle by some of the customers. One of them, a Canadian, instantly was drawn to my two Canada stickers, which he loved. He told me he was thinking about a V-Strom and was glad to see one in the wild being used as it was intended. I highly recommend the raspberry cheesecake. I continued north on Highway 35, eventually meeting up with (gasp!) the Interstate to make my way through San Francisco. I hit the city right at the start of rush hour, so it was slow going, but splitting lanes made things a little quicker. 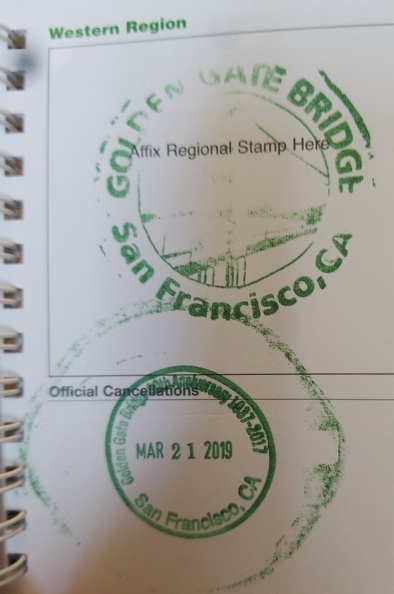 I made a quick stop at the Golden Gate Bridge for that missing photo op and to get some more National Park stamps. I decided to cheat again (the horror!) and got a room in Santa Rosa. With bad weather in the forecast I would re-evaluate the plans for my remaining days as the weather changed. I made a stop for gas in Rohnert Park and was approached by another customer. 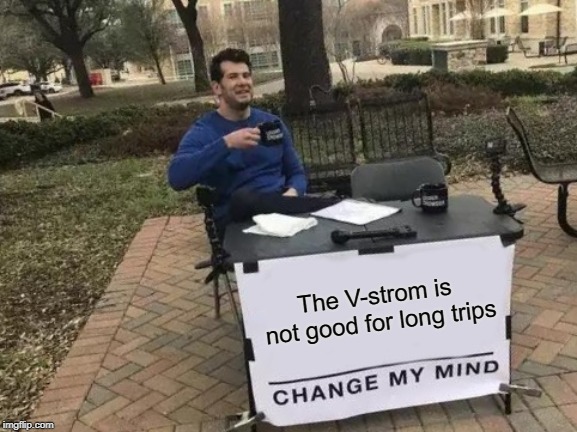 He told me he had a similar V-Strom and complimented my on mine. He told me he didn’t think the bike would be a good choice for long trips. 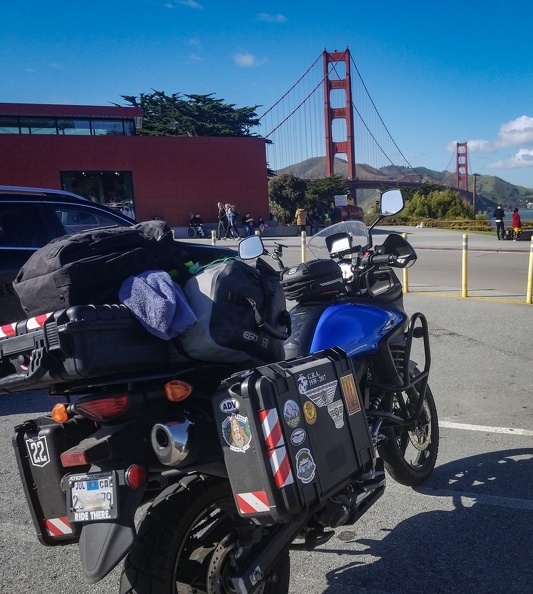 He was shocked when I told him I had taken mine to Canada and had been riding around California for the last week. Maybe he’ll get out there and see for himself and change his mind. The weather didn’t improve in Santa Rosa, and I ended up spending the previous day there. It gave me a little time to do a complete proper load of laundry and to do a little cleaning of gear. 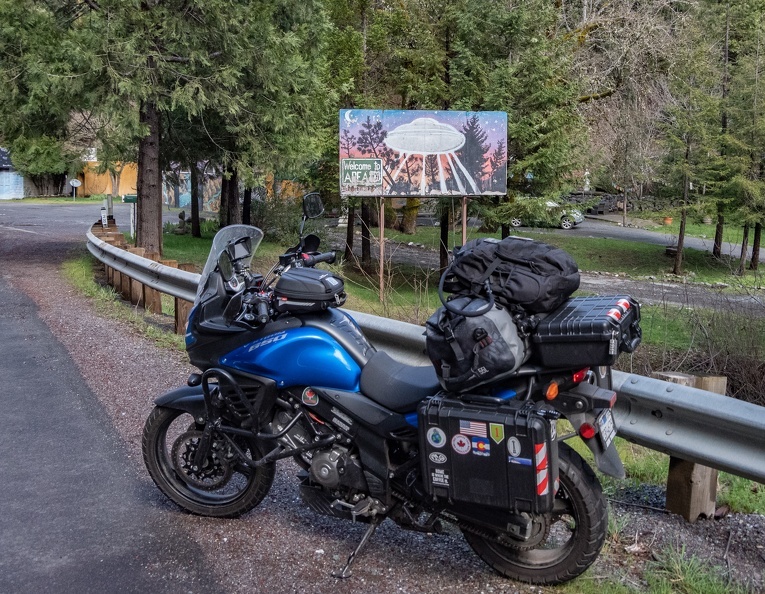 I headed north on Highway 101 for the final stretch home. There’s so much more of California to see, but that will wait for another time. I rode through acres and acres of Sonoma and Mendocino County vineyards. Their grapevines were neatly lined up in ranks and files like soldiers on formation and stretched from the edge of the highway up into the hills. I made my way back through Leggett, where my journey essentially began by riding through a tree. I hit a patch of rain going through the Leggett area. It only lasted a few minutes, but plenty of it was able to make it under my helmet. I tried to take Highway 271, which is the old alignment of Highway 101, at Piercy to change things up, but alas the road was closed. I soon crossed back into Humboldt County and wound my way through the towering redwoods of Richardson Grove. I hit more rain, this time heavier, in Weott. This patch of rain was shockingly cold, and my heated grips on full were not doing much to make my hands more comfortable. I made it home between 1 and 2, and was greeted by a happy family. Another adventure in the books. I started out the trip with just a plan of visiting some seemingly unrelated places. Along the way, I discovered the thread that connects these places, and a much of California, together – the earth’s forces, always in motion, making California the beautiful place that it is. At times I felt lonely. But I also reveled in the silence and solitude, finding beauty in both and experiencing those things you just can’t put into words and have to experience yourself.